Kiwa donates to Oxfam Novib, a NGO offering microcredits in developing countries. At Kiwa, we value and foster entrepreneurship among colleagues. We do exactly the same as a Company Ambassador for Oxfam Novib, a branch of the international NGO Oxfam, which fights poverty all over the world. Entrepreneurship is all about taking matters in your own hands and, especially in developing countries, fighting poverty. 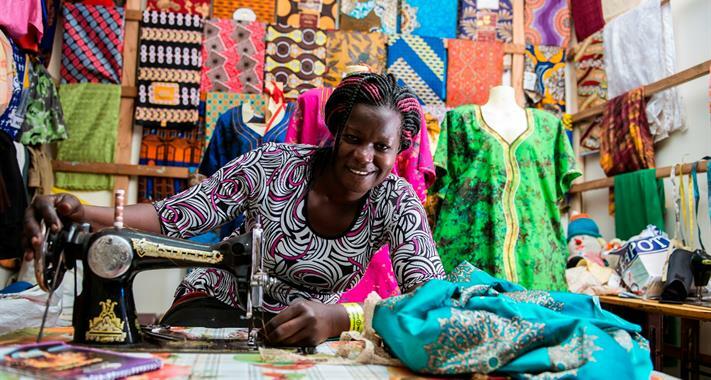 Oxfam Novib's microcredits and education allow people to kickstart their own small-scale business and to build a better future for themselves, their families and the societies they live and operate in. While banks and other financial institutions in developing countries are not that trustworthy as lenders, possibilities for financing a business are quite limited. Oxfam Novib effectively fills that void by supporting further development of small and medium-sized enterprises with loans. We're enthusiastic about entrepreneurship and we're enthusiastic about this initiative. Kiwa strongly encourages the principle of microcredits to help start-ups in developing countries. These relatively modest loans directly help small companies develop and flourish on a local scale. As we are a confederation of locally-oriented companies ourselves, microfinancing adheres to our own strategy. As a so-called Company Ambassador (and as a Partner for Progress!) we yearly donate a certain amount of money which Oxfam Novib uses for microcredits. It implicates we give entrepreneurs all over the world an opportunity to set up and develop their businesses - together with over 700 other ambassadors. Thus, we also support the United Nations' Sustainable Development Goals, which are an integral part of our Corporate Social Responsibility efforts and ambitions. In 2018 Oxfam became headline news due to staff being accused of sexual exploitation and abuse in Haiti during the earthquake response in 2011. It involved employees of Oxfam United Kingdom; still, the affair had a negative impact on Oxfam as a whole. In a statement, the Board of Kiwa expressed its disapproval of the events and the people involved. Still, as we are convinced of the value and the principle of microfinancing and as we don’t want entrepreneurs in developing countries to become the victims of a few misbehaving Oxfam staff, we decided to continue supporting Oxfam Novib. In February 2018 Oxfam has released a report into the allegations of sexual misconduct in Haiti. They also announced a comprehensive action plan to strengthen safeguarding systems across the organisation and stamp out abuse. Read more on the Oxfam Novib website. Would you like to know more about our Oxfam Novib ambassadorship? Please contact us via Corporate.Communication@kiwa.nl.